We hope you're getting some serious VR kicks at the moment. We certainly are with Google Cardboard and the Samsung Gear VR. And now in a wonderful meeting of minds, Mattel and Google have joined forces to power up the iconic View-Master with virtual reality smarts. The kid-friendly viewer is now on sale in the US. The Starter Pack comes with a Preview Reel, which lets you explore content from the three VR apps already available on iOS and Android - Space, Destinations, and National Geographic Wildlife. Like the DIY Google Cardboard cases and the recently announced VR for G3 from LG, the new, plastic View-Master needs a smartphone to provide the processing and display for Google Cardboard apps. But what makes the View-Master a bit of a magical mash-up is that it can still work with old-school, physical "reels" of AR animations including one that's a tour of a space shuttle. Themed reels will be available to buy separately as cardboard discs or downloadable updates. In terms of viewing View-Master reels, the kids headset supports iPhone as well as Android. The toy itself is 75 years old and Mattel says over 100m of them have been sold to date. So it's nice to see the collector's item getting a tech injection that should lead to more kids getting to play games and demo thanks to this no-frills , affordable VR platform from Google. 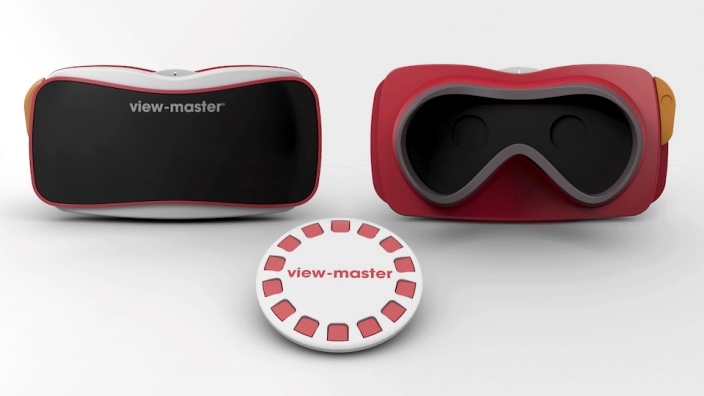 The new View-Master is now on sale for $29.99 in select stores with additional reel packs coming soon $14.99.